Fourth day of the Ghacks Christmas Giveaway. We already handed out Kaspersky Internet Security 2009, Newsbin Pro, Giganews Accounts and MediaMonkey Gold licenses. Today's giveaway is Display Fusion Pro, one of the better, if not the best, multi-monitor desktop wallpaper and window management applications. Display Fusion can be downloaded as a free version from the developer's website with limited functionality. The pro version of Display Fusion can be ordered as well on the same website. The version comparison between Display Fusion and Display Fusion Pro list the features that are only available in the Pro version including wallpaper rotation, custom hotkeys or the fine tuning of the background image position. The main feature of Display Fusion is to display wallpapers on multiple desktops. The user may display different wallpapers on each desktop or use one wallpaper that spans across all of them. Each computer monitor connected to the computer system is displayed in Display Fusion's main interface. 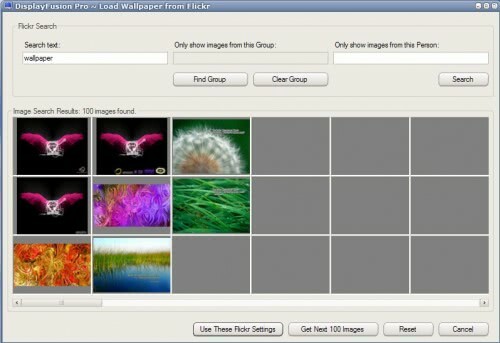 The user can load wallpapers from his computer or Flickr and make them the default wallpaper for the computer monitor. 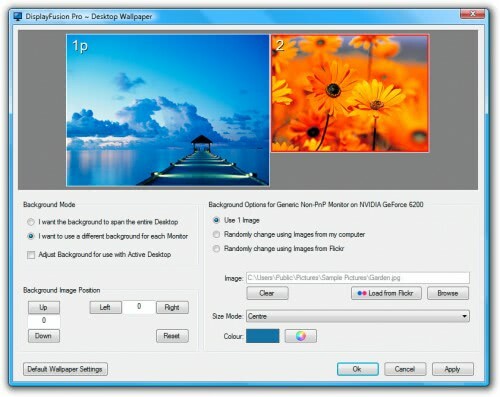 Display Fusion Pro provides access to background image positioning which can be used to fine tune the location of the wallpaper on the monitor. It's also possible to use one of the seven display modes that range from stretching the image to fitting the width or height while maintaining the aspect ratio of the image. Users of Display Fusion Pro can enable wallpaper rotation in the same interface. They can either add a list of wallpapers from their computer or get their wallpapers directly from Flickr. Images can be grabbed from Flickr users, groups or by searching for text. The wallpapers set will then be used to rotate the computer's wallpaper in a time interval specified by the user. One interesting option is to freeze a wallpaper. This will stop the process of rotating wallpapers and make the current one the default wallpaper. Display Fusion comes with window management features as well which have been specifically designed for multi-monitor systems. Windows can be easily moved between computer monitors including maximized windows. It is furthermore possible to position windows on the same computer monitor. It is for instance possible to center a window on the current monitor or to snap it to one of the monitor's edges. One main benefit of Display Fusion Pro is the ability to configure custom window sizing and moving hotkeys. Other interesting features include Window Snapping with the option to exclude applications from it or maximized window dragging between computer monitors. The newest Beta of Display Fusion Pro enabled another long requested feature to the application. Users can enable a taskbar on every computer monitor. The feature is still beta but it already provides two possibilities for users. The first is to display a Display Fusion Taskbar on additional monitors that is showing all windows like the taskbar on the main computer monitor. The second option is to only display the windows that are open on each monitor. Jon Tackabury is regularly updating his website Binary Fortress with new information about Display Fusion and other software projects. Five licenses for Display Fusion Pro are up for grabs. Just reply in the comments and let us know that you want one. I 1st heard about display fusion here at gHacks. I’ve istalled the free version and I advise it to everyone. This will be so useful for projects and I would love to make my own wallpaper. Very interesting and would like to win it! Still waiting for some multi-platform giveaway but anyways, I’m in. I’m running the free version today as well and I’d love to get the professional. TIA! I allways like to have different wallpapers so this program, would be ferry nice to win. I hope that I don’t win! With the exception of the wallpaper rotating, all these features are built into KDE. I have no need for to _pay_ for software that does what should be built into the OS. I’ve been running the free version for a couple months, and absolutely love it! Count me in!! I’m no good at loads of stuff but playing about with displays etc is my kinda thing :) I def want one! Have to say this product is dam cool especially for those vista users where NVidea went all mental and couldn’t understand how to control dual views in Vista this product came to the rescue. I love this app, just never got around to getting a pro copy. I would love to get a copy of Display Fusion Pro. Great :D (Now I can have diffrent wallpapers on my big and small screen ! I would very much like a license for display fusion pro. I would also like one internets, please. Win, lose or draw? No, let me win…PLEASE! I have been searching for just such a program. This would be nice! This sounds useful. I’m particularly interested in the beta taskbar feature. i like to change my desktop wallpaper a lot…. this will come handy…. I would like one. Give me an excuse for multiple monitors. Just bought my second monitor… i’d like to use this. Awesome choice, Martin. As always you, and the rest of the gHacks staff, rock. I use 4 displays on my system, and this program would be a considerable plus. Well, it’s a nice program. I’d like one … thanks for offering these ! I love Display Fusion and would love to have a Pro license. This software looks nice. Currently I’m using just a simple soft to randomize my desktop wallpaper on startup. Even if I don’t get a pro licence, I think it is worth installing a free version of it. I’ll try it out. I’d like one very much. Thanks. i want to try it out! Thanks! I use the free version, the Pro one would be fantastic. Sure looks like a nice piece of software to have for Christmas! Por favor dame un senor. ¡Me gusto mucho! Looks like something I could do with! I’d love one. Thank you! Wallpaper? We don’t need no stinkin’ wallpaper! I usually change to a black background desktop in the first 10 minutes of owning a box. But my wife really likes to see the pretty under whatever she’s working on. If your still handing them out I would more than like to have on. My second time to the site. I have a feeling it is going to take me some time to explore. Interesting, I hope i get one. I love DisplayFusion. May I have a copy of Pro, please? I want one too! I would really appreciate a key. Ive always wanted to see the pro version of Display Fusion, Can I Have it? Hi, i would really like a key for the full DisplayFusion program… I use four monitors and the multi task bar feature would be great!! I am running the trial version and would love to own it. Please count me in! This program is really useful if you are running dual monitors in different modes. I keep one monitor in portrait for viewing full page documents, while the other stays in landscape for surfing and editing. I’ve been using the free version for two years now and would gladly go Pro. Please give me one also. thanks thanks!